Chippewa Wedge-Loc was founded in 1993 by inventor and designer Terry B. Smith, and operated by Terry & Rebecca J. Smith for twenty years. John Brassard & Troy Gullquist then maintained the business from 2013 until 2019, when David and Marcus Yoder purchased Chippewa Wedge-Loc to continue manufacturing the highest quality stands and stand accessories. Our assembly plant is located in Arthur, Illinois, and we are proud to make all of our stands in the USA. 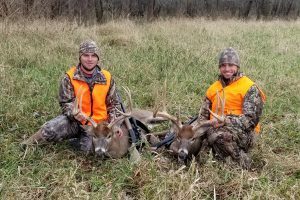 We are brothers who have been working together for ten years as small town local contractors, and we are excited to acquire Chippewa and combine our passion for hunting with the hard-working business principles that our company has been demonstrating to our community for the past decade. Wedge-Loc stands are hands-down the best, and we are proud to continue building them with the same integrity right here in rural Illinois. Thanks to all of our customers for your support. Safe and happy hunting!